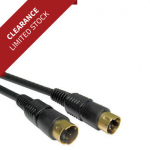 A huge range of S-Video leads and cables designed to carry high quality signals between compatible equipment. Most older AV equipment and many older Pcs have S-Video ports. S-Video is a technical specification for the transfer of video information via a 4 pin mini din cable. These leads are sometimes also referred to as ‘S-VHS’ leads, which is technically incorrect. However, the two names can be, and often are, used interchangeably for the same type of cable. If you are seeking information on how S-Video connectors and cables are wired, visit our S-Video Wiring page in the Technical Library section of this site.